Eggplants were so lovely at the market this weekend, I thought I would use some to make a lasagne. 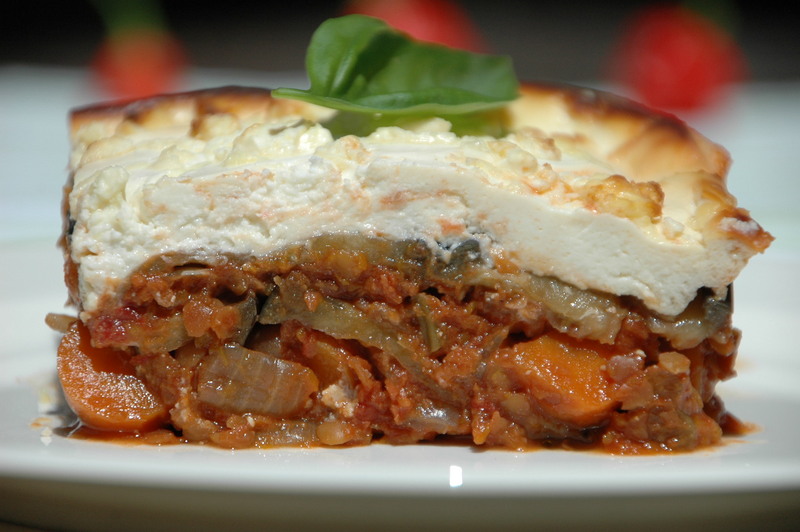 A quick check of my pantry and I decided on a red lentil and eggplant lasagne, perfect for Meat free Monday. Since we still have lots of basil growing in the garden, that had to be included too! I like to make my Meat-free Monday dish on the weekend so all I have to do is heat it up when I get home from work. That way we don’t end up eating too late. This lasagne was perfect for that. I made the sauce and put it together on Saturday. All I had to do tonight was pop the lasagne in the oven (take the dog for a walk) and make a quick salad to go with it. 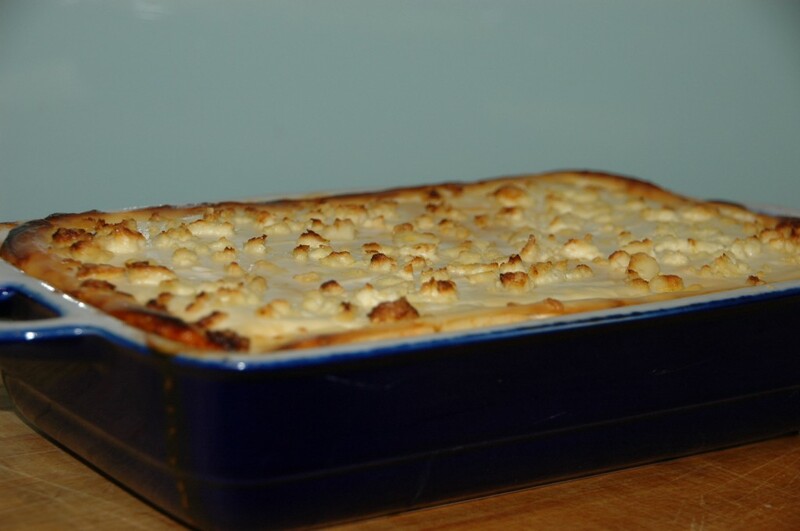 The lasagne made 5 serves, so we have some left for dinner later in the week, or lunches or perhaps I will freeze it? Remove the stalk from the eggplants, then slice them lengthways into ½ cm thick slices. Place some slices in a colander which you have set over a large bowl. Scatter a little salt over the slices, then keep on layering the slices using up the salt as you go. Set aside and allow the eggplant to release any bitter juice over the next half hour or so. Meanwhile, start on your sauce. Heat some oil in a large heavy-based saucepan over medium heat and then sauté the onion and garlic for a few minutes. When the onion starts to soften, add the celery, carrot, pumpkin and tomato paste and sauté for a further five minutes. When the wine has reduced by half, add the tomatoes, lentils and salt. Rinse the tomato tin out with about half a tin of water and add. Allow to come to the boil, then reduce the heat to a slow simmer, place a well-fitting lid on the saucepan and simmer gently for half an hour. From time to time, give the sauce a good stir. When cooked, stir through parsley and pepper. Rinse eggplant slices well and place on paper towel to dry. Heat about 3 teaspoons of oil in a large heavy-based frying pan and add the eggplant slices, a few at a time. Fry for about two minutes on each side until they start to turn golden brown and soften – drain on paper towel. Repeat with remaining slices adding only a small amount of extra oil each time. Layer a third of the eggplant slices on the base of a lasagne tray. Cover with half of the lentil mixture. Scatter half of the basil over, then cover with another third of the eggplant slices. Cover with the remainder of the lentil mixture and scatter the remaining basil over, then cover with remaining eggplant slices. In a food processor, process ricotta and milk together for 20-30 seconds until smooth. Spread over the eggplant slices, smooth out, then top with crumbled feta. Bake for 30-40 minutes until the top is golden and bubbling. Remove from oven and allow to sit for ten minutes before slicing and serving. Serve with a green salad. 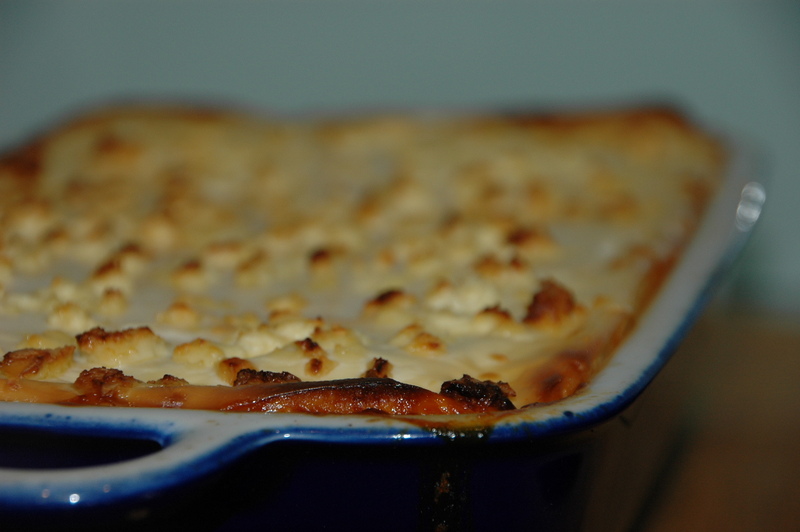 This lasagne can be made ahead of time and stored in the fridge uncooked for up to three days. It can also be cooked and cooled, then stored in the fridge for three to four days. Reheat individual slices in microwave. It can be frozen for up to one month cooked or uncooked. Allow to thaw before cooking.